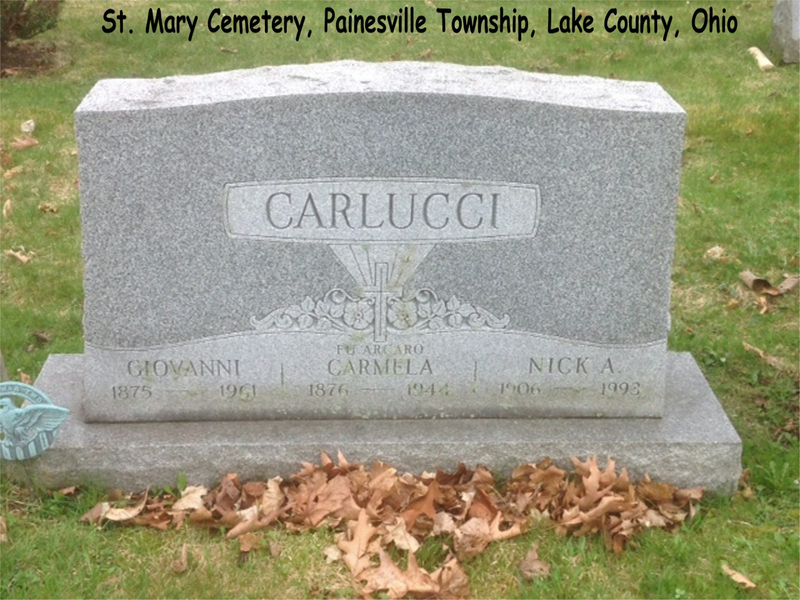 Carmella Arcaro’s name appears on a tombstone St. Mary Cemetery, Painesville Township. Her husband, Giovanni Carlucci, and son, Nicola Carlucci, lived in Painesville at the time of Carmella’s death in 1944. There is no evidence that she ever lived in Painesville. She may have been living with her son, Michael, in Niagara Falls, Canada. Carmella Arcaro was born in 1876, at Sant’Angelo in Grotte, Italy. She married Giovanni Carlucci in Italy. Carmella died in February, 1944. Her body was interred at St. Mary Cemetery at Painesville Township, Lake County, Ohio.